I am lucky enough to have visited Hugletts twice recently. 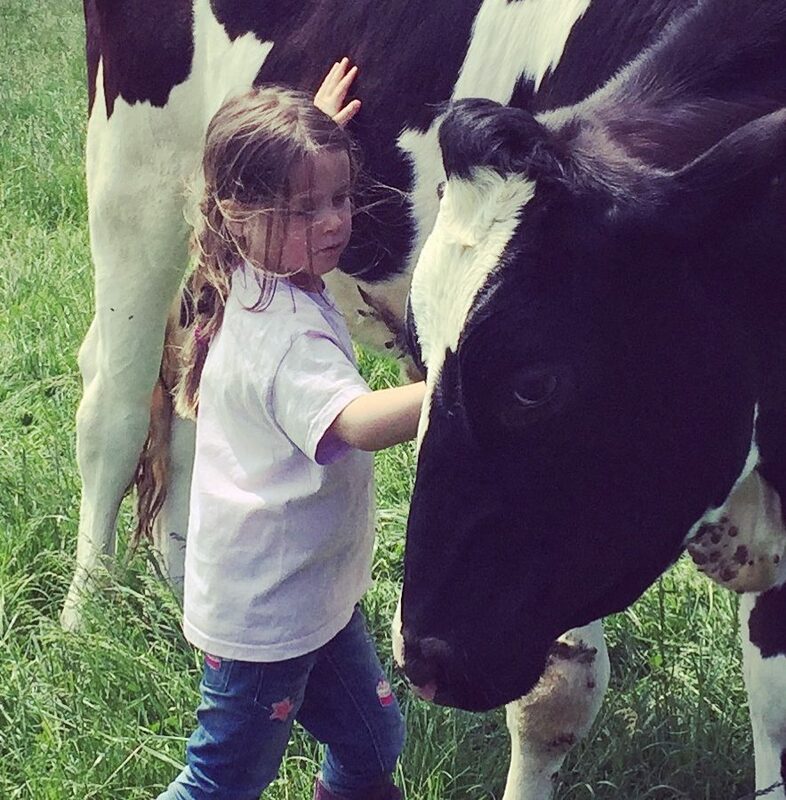 It’s as far from a normal farm visit as you could imagine. The peace in this place is breathtaking. The concept that farm animals come first over humans here leaves you soberly aware of the wrongs of the world outside these gates. 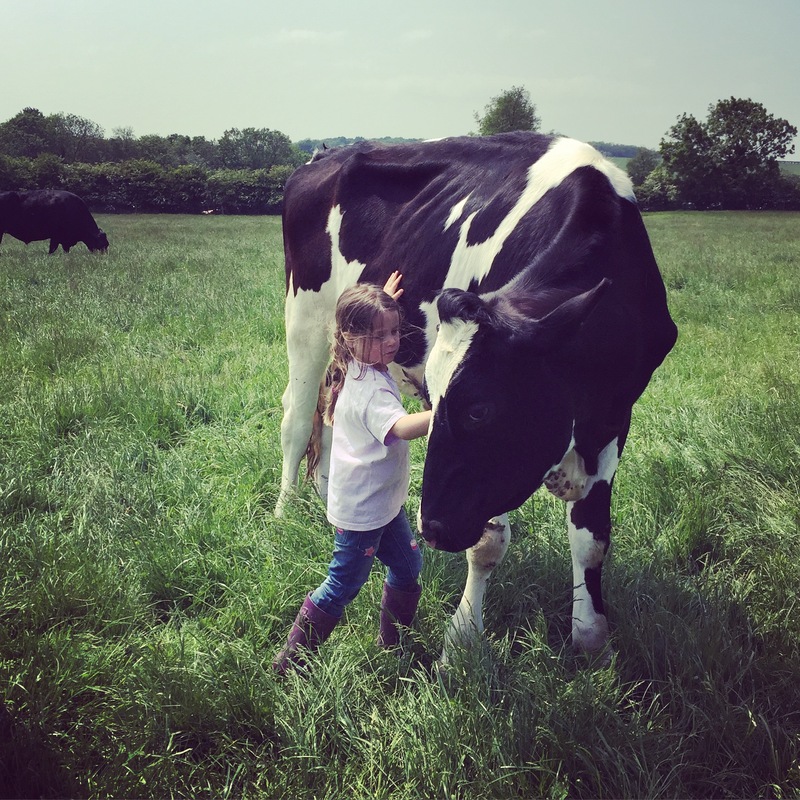 The first time I came here, we were allowed in groups into the field to hug cows – I’ve always wanted to do this and yes, you really can here. I was struck by the size of these gentle animals up close and personal. Allowed to behave naturally and live in the herd for their natural lifespan, they grow huge, with beautifully soft coats and contented, ruminating expressions. Ruby and I lay in the sun, hugging and enjoying these gentle giants’ company, and I have to admit it was one of the most beautiful things I have done. The first thing we did when we entered the field, as instructed by the sanctuary owner Wenda, was to quietly and respectfully greet the herd leader Bruce, before wandering as it took our fancy through the rest of the field, greeting cows (from the side on so as not to be taken as aggressive) and letting them greet these strangers in their field. There was no fear for us or for Ruby, our 5-year-old daughter, as we allowed the cows to nuzzle us and investigate our presence. I found tears running down my cheek as I spent these golden moments with the cows. Ruby and I lay in the sun, hugging and enjoying these gentle giants’ company, and I have to admit it was one of the most beautiful things I have done. Even my husband, never a cow-hugger, must have felt a slight drip-drip of his heart defrosting at the sight. It’s hard to comprehend how much suffering is inflicted on these intelligent, inquisitive and sensitive animals, and why. I found tears running down my cheek as I spent these golden moments with the cows. Usually horrified at such displays of emotion I embraced Nigel Prema, and whispered sorry to him over and over again. I felt an overwhelming feeling of completeness, a confirmation that being vegan is the right way to live my life as an animal-lover. I was relieved that I could look the cows in the eye knowing I live my life in a more respectful way these days. what I can only describe as the perfect day. Regrets soon turned to joy as humans and cows soaked up the glorious summer sun. We could have stayed there till dusk, probably till dawn, perhaps forever. 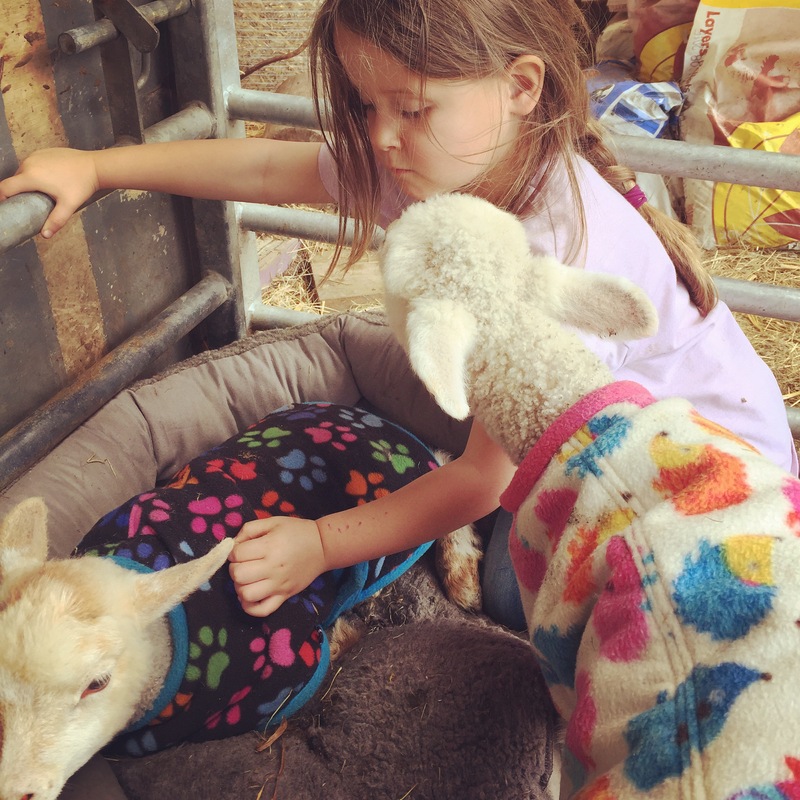 The rest of the farm is just as magical, the sweet little lambs were happy to let Ruby cuddle and play with them, and the chickens eagerly pecked crumbs from her hand completing what I can only describe as the perfect day. 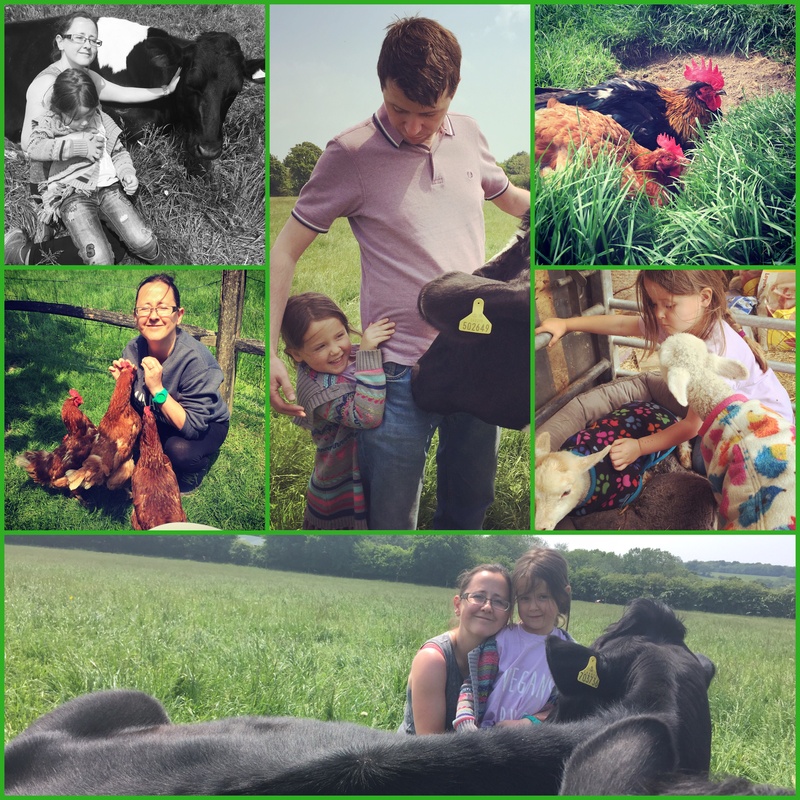 The farm is self-funded and donations are gratefully received. For more information on open days, to donate and see the wonderful work that they do check out their Facebook page.